As the weather heats up in South Texas, the insect pests come alive in our gardens. This is the time of year when we gardeners go looking for the perfect pesticide to protect our plants. Thomas Jefferson received a letter along these lines from his daughter, Martha. Martha Jefferson had grown up and gotten married, and she and her husband lived on a plantation not far from Jefferson’s farm at Monticello. Jefferson, one of the great farmers of American history, knew every trick in the book for fighting pests. But instead of prescribing an elixir for each insect attack, Jefferson advised her to apply a thick layer of fertilizer to her fields. Jefferson’s advice is the cornerstone of organic agriculture. In fact, the working definition of organic gardening is to treat the soil, and allow the nutrients in the soil to take care of the plants. Healthy soil grows healthy plants, and strong plants resist disease and insect attacks. As Jefferson saw it, the best pesticide in the world is healthy, humus-rich, well-balanced soil. On the other hand, unhealthy soil grows weak plants, and weak plants are bait for bad insects. Insect pests are designed by nature to seek out unhealthy plants and cull them from the gene pool. This is simply the law of natural selection at work in the garden. All of nature conspires to destroy unhealthy plants, and disease and insects are the tools that nature uses to kill them. If the soil in your garden is weak, pest attacks are most likely just a symptom of the real problem. 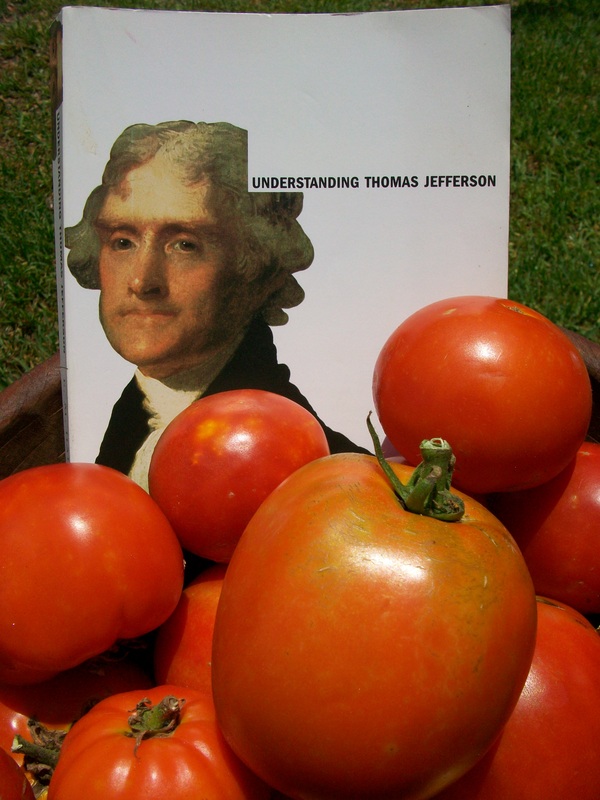 Thomas Jefferson told us through his writings exactly how he grew such rich and vibrant soil. Next week, we will show how the animals on our farm in Rockport help us grow healthy soil for our crops–the same technique used by Thomas Jefferson in the gardens of Monticello. I’ve not thought about it, but this makes sense. Every time I’ve given my potted plants some “fresh dirt” — an organic landscape mix that’s mixed at a local nursery — they just go crazy. Nothing like discovering the obvious! Yes! My analogy is that weak plants are like people with a compromised immune system–they tend to catch every bug that comes along. Healthy plants are like healthy people; they miss most of the bugs, and when they get sick it is not as bad and they recover faster. To take the analogy further, plants get healthy by growing in good soil, and people get healthy by eating strong, healthy plants. We are truly connected to the soil our food grows in, and our health reflects it. Thank you so much! I hope you are enjoying a beautiful view today! I found it’s the same with animals, dogs attract fleas easily if their food doesn’t nourish them, creating weak immune systems. Thank you Agi! I know that you guys wrote the book, literally, on dogs! We have seen this also with our dogs, how much their health reflects their diet. Our dogs eat a lot of bones and raw meat from our animals, and every day they get scrambled eggs. Their coats are beautiful, and they are very healthy and happy dogs! Thanks Agi, all the best to you!